HAIM launched the campaign for their second album with an in-studio video for new track Right Now. While the sisters are known for their catchy pop hooks and dance routines as much as being instrumentalists, this video focused more than ever on the latter. It posed them as authentic ‘real’ musicians, hard at work in the studio, visibly making music, headphones on and concentrating. Where’s the fun? Right Now, though, was the right track to launch with. 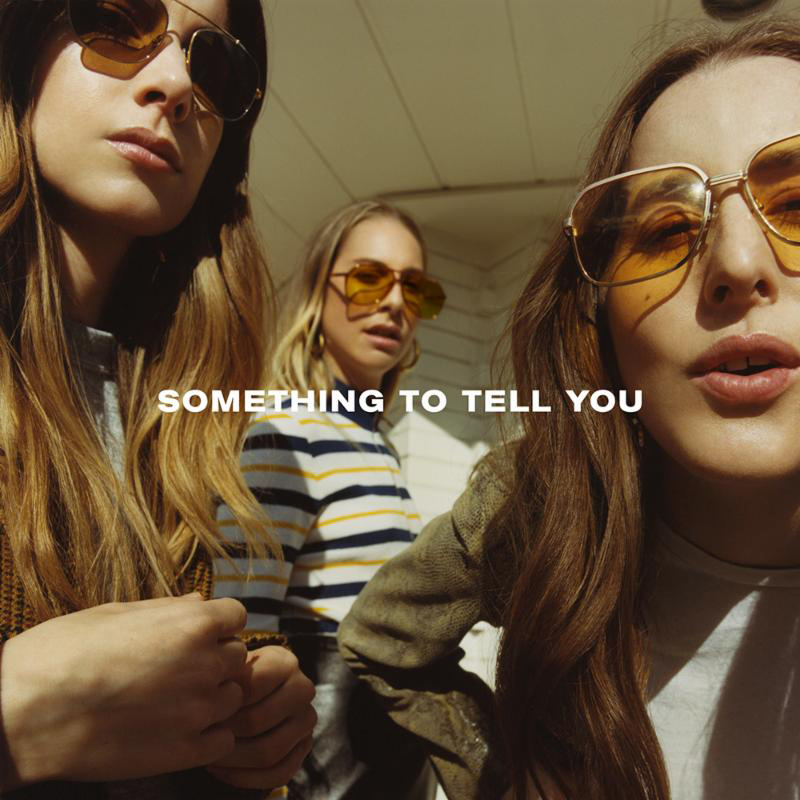 ‘Something To Tell You’ is the more serious follow-up to their debut ‘Days Are Gone’ – an album with tracks written when the girls were still teenagers. Now they’re showing off their musicianship, their production skills, their more complex songwriting. It certainly sounds like a HAIM album, but something’s missing. As with their debut, HAIM take the soft-rock of the ‘70s and ‘80s (Fleetwood Mac most notably of all) and whip it up with modern pop and R&B. That’s at its most prevalent on You Never Knew, co-written with Dev Hynes. The laidback tropical feel of its groove all covered in glittering sparkles, it’s immediately recognisable as his work but tempered with the cascading acoustic guitars and vocal harmonies that make HAIM…HAIM. It’s there too in the subtly driving Nothing’s Wrong that sounds straight from Fleetwood Mac’s ‘Tango In The Night’, it’s in the stuttering R&B rhythms and funk guitars of Ready For You (co-written with Twin Shadow), the clattering percussion and bubbling bass of the title track. They’ve also incorporated that mainstay of pop: upbeat production with aching melancholy. Kept Me Crying for instance details hanging on the phone for a lost lover (“Kept me crying for so long my tears have dried,” sings Danielle) while drums beat incessantly. There’s a simplicity to the lyrics that really hits home, with lines like “sleeping back to back, you’re turning away” on Nothing’s Wrong, or there’s lead single Want You Back that repeats “just know that I want you back” with yearning desperation over funk guitars and piano chords of quiet finality. It’s rhythm that ties their sound together, be it funk grooves, laidback shuffles, or pointed vocal hooks with a delivery that’s heavy on the consonants. Yet this hinders the melody writing, which tends to consist of short rhythmic phrases, giving their music its distinctive character – the songs are all quite literally bops – but lacking a sense of flow or lyricism. In attempting a hook-laden pop sound, the music just sounds choppy and, ironically, unmemorable. As a result, most of ‘Something To Tell You’ lacks the immediacy of their debut and the album lacks a real killer track to draw in pop fans. It takes time for these songs to unfurl. Instead, the sisters have focused on cementing their sound. And while ‘Something To Tell You’ doesn’t stray too far from the familiar - owing to the continued production of Ariel Rechtshaid - there’s still room for some experimentation. Little Of Your Love has more of a doo-wop feel though it feels a little saccharine; Found It In Silence revolves around an urgent string refrain that mostly eschews the girls’ trademark guitars; and Walking Away is all sparsely hushed synths and minimalist percussion. That brings us back to Right Now, a track that encapsulates much of ‘Something To Tell You’. Its lyrics depict a love gone unresolved and in its structure the song slowly develops without reaching a true climax, layering up its roaring guitars and thunderous drums over simple piano chords. It’s a clever integration of music and lyrics, the lack of resolution as frustrating for us to hear as for the protagonist. This is, right now, a new era for the band – one of serious musicianship and pop-rock rooted in sadness. You won’t find much dancing here. Listen: ‘Something To Tell You’ is out now.